Today, Michelin announced a new sport-touring tire, the Michelin Road 5. Although the Road 5 supersedes the Pilot Road 4, the Pilot has been dropped from the name in an effort to differentiate Michelin’s road-going offerings from the more hard-core sporting Power line. The primary change between the Pilot Road 4 and the Road 5 takes place in the tread’s siping and the incorporation of ACT+ technology seen earlier this year on the Michelin Power RS. Riders on Road 5s will notice the biggest improvements in wet performance, particularly when the tires are worn where, according to Michelin, they will outperform all other entries in the sport-touring tire segment. The company claims that Road 5 tires with 3,000 miles on them offer the same wet-road stopping power as brand new Pilot Road 4 tires. This is thanks to the XST Evo (X Sipe Technology), the third generation of XST found on Michelin motorcycle tires. (XST was introduced with the Pilot Road 3 and XST+ with the Pilot Road 4.) XST Evo sipes feature a patented teardrop shape as they get closer to the carcass of the tire. To understand why, we need to look at what a sipe does. The inverted V-shaped sipes are where the new technology comes into play. While uniformly narrow at the surface of the tread, they widen with depth to displace more water – even when worn. Sipes offer a place for water to go as the contact patch rolls over a wet road. When tires are new, they can, not surprisingly, displace more water because the sipes themselves are deeper. However, as the tread wears away, the sipes get shallower, limiting the amount of water they can displace. The enlarged inner depths of the XST Evo sipes in Road 5 tires can, according to Michelin, hold as much water as new Pilot Road 4 tires – even after 3,000 miles of use. This translates into comparable performance for the used Road 5 tires and brand new Pilot Road 4 tires. If this is confusing, take a look at the photo and video below. The blocks in the diagram above represent a XST+ sipe on a new tire tread (top) versus on a worn one (bottom). 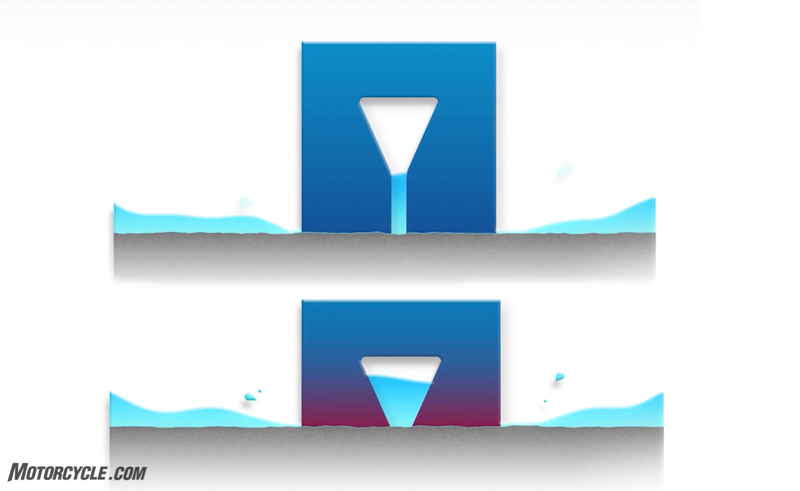 Without the enlarged inner section the water would completely fill the sipe on the bottom. 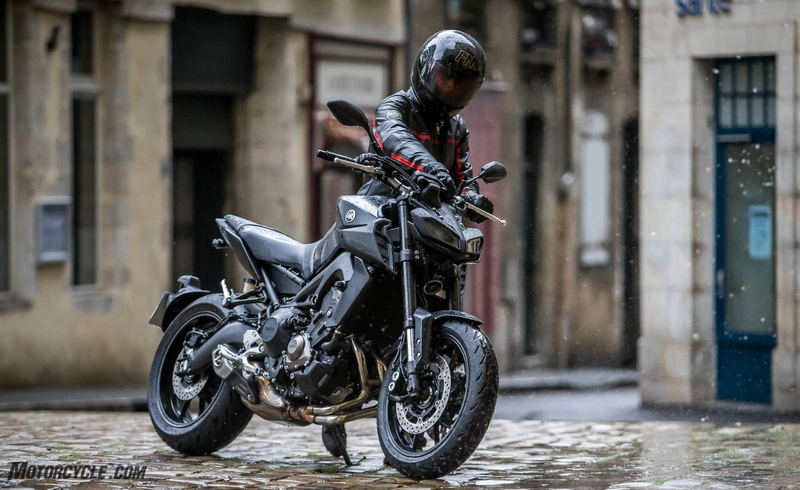 While this is new technology for motorcycles, Michelin first introduced XST Evo’s technology in its Evergrip™ tread design in 2014 in the Michelin Premier A/S automobile tire which introduced the maintaining of wet-braking performance as the tire wears. Michelin is very proud of this accomplishment, and when we met with them yesterday, their primary purpose for getting together was to show off the new Road 5. We always expect hyperbole from PR people, and we remember the Power RS being called the “perfect tire” at its introduction in Qatar. However, it wouldn’t be an understatement to say that Michelin is very confident in the Road 5’s performance, and they say they have the independent test data to back it up. The photo below shows the independently verified results from wet weather track testing. To summarize, it shows the best lap times on the Road 5 compared to the Metzeler Roadtec 01, Pirelli Angel GT, Continental ContiRoad Attack 3, Bridgestone Battlax T30 EVO, and Dunlop Roadsmart III, and the numbers are impressive. Now, more than ever, we can’t wait to sample these new tires and find out for ourselves. 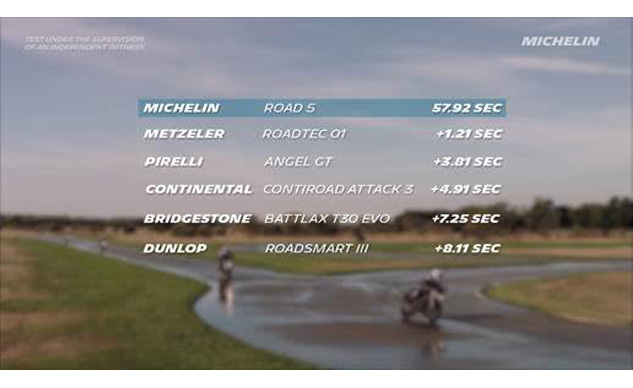 Michelin Road 5’s wet track lap time comparison to its competitors are impressive and independently verified. However, the Road 5 isn’t just about wet-weather conditions. Dry performance also gets a boost, thanks to the inclusion of ACT+ (Adaptive Casing Technology). Michelin first released the ACT+ in the Michelin Power RS, and now, it makes the move to sport-touring tire. The key characteristic of ACT+ is its ability to create a softer crown while maintaining a stiff sidewall. 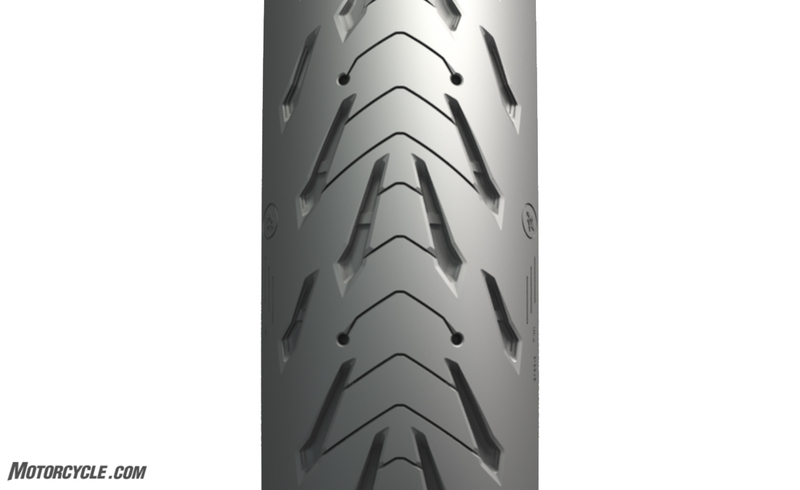 The tire’s 90° casing maintains the tread’s suppleness in the center for a stable straight-line ride. This same 90° casing wraps around the bead and doubles over on itself, giving the sidewall the stiffness necessary to handle cornering forces. ACT+ allows for Michelin to tune in the correct amount of sidewall stiffness for a tire’s intended purpose by adjusting the amount of overlap of the sidewall casing. Michelin says that the Road 5’s wet-weather performance will exceed that of all of its competitors – even after 3,000 miles of use. Beginning on January 1, 2018 the Michelin Road 5 will go on sale nationwide – and Michelin told us they were serious about this date and will be preloading the tires to major distributors for release on that date. The two front sizes and five rear sizes will fit a wide variety of sport -touring motorcycles. Prices have not been set at press time, but expect them to be comparable to those of the Michelin Pilot Road 4 tires they replace. GREENVILLE, S.C., Nov. 2, 2017 – Michelin today announced the MICHELIN® Road 5, its newest motorcycle tire, designed specifically for sport touring motorcycles with patented technologies that provide riders with enhanced grip, comfort, and stability, particularly in wet conditions. Available in January, the MICHELIN Road 5 incorporates patented XST Evo siping and ACT+ technology to add a new dimension of confidence in wet and dry conditions over the life of the tire. Even after 3,000 miles, a MICHELIN Road 5 tire stops as short as a new MICHELIN Pilot® Road 4 tire when braking in wet conditions. The MICHELIN Road 5 tire builds on the innovative designs of two distinct predecessors, the MICHELIN Pilot Road 4, and Michelin’s leading automobile tire, the MICHELIN® Premier® A/S. The wet grip of a worn MICHELIN Road 5 tire is as good as a new MICHELIN Pilot Road 4 tire thanks to Michelin’s revolutionary patented MICHELIN XST Evo water drop sipes, which grow wider mile after mile. In 2011, Michelin revolutionized motorcycle tire design with the patented MICHELIN XST sipe design which was enhanced again in 2014 with XST+ siping technology found in the MICHELIN Pilot Road 4. Designed to evacuate water efficiently, which helps increase confidence during wet conditions, this technology now leads the segment for wet grip performance. The MICHELIN XST Evo represents a new iteration of siping in the MICHELIN Road 5 tires. This technology is borrowed from the tiremaker’s Evergrip™ tread design, first introduced in the MICHELIN Premier A/S tire in 2014. The Premier A/S for passenger cars introduced the breakthrough concept of maintaining wet-braking performance as the tire wears. In addition to optimizing wet grip, the MICHELIN® Road 5 tire is designed to ensure outstanding grip on dry roads and superior stability compared with its predecessor, thanks to a combination of all new tread compounds and revolutionary adaptive casing technology called MICHELIN ACT+. The design of the casing ply, introduced in MICHELIN Power RS tires, incorporates high angles and overlapping cross plies, which allows for exceptional cornering stability while maintaining the high-flexibility in the crown for straight-line stability. The new MICHELIN® Road 5 will be available in two front and five rear sizes to fit a wide range of sport touring motorcycles. The tire will go on sale at retail locations nationwide starting Jan. 1, 2018. Based on internal wet lap times comparing MICHELIN® Road 5 tires with METZELER® Roadtec 01 tires, DUNLOP® ROADSMART III tires, CONTINENTAL® ContiRoadAttack 3 tires, PIRELLI® Angel GT tires, BRIDGESTONE® T30 EVO tires, and MICHELIN® Pilot® Road 4 tires in dimensions 120/70 ZR17 (front) and 180/55/ZR17 (rear) on a 2013 Suzuki® Bandit 1250, conducted in Ladoux, France. Actual results may vary. Based on internal wet braking testing comparing new MICHELIN® Pilot® Road 4 tires and worn (3,502 miles) MICHELIN Road 5 tires in tire sizes 120/70 ZR 17 (front) and 180/55 ZR17 (rear) on a 2013 Suzuki® 1250 Bandit S, conducted in 2016 in Ladoux, France. Actual results may vary. Based on third party commissioned tests comparing MICHELIN® Road 5 tires with MICHELIN Pilot® Road 4 tires in tire sizes 120/70 ZR 17 (front) and 180/55 ZR17 (rear) using a 2017 Kawasaki® Z900 conducted by MTE Test Center in Stuttgart, Germany. Actual results may vary.